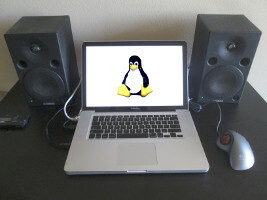 This page describes how to install a Debian 8.7 (Jesse) Linux operating system on a MacBook Pro 8.2 notebook computer. Linux will run fine on this machine, although there are some quirks that make installation a bit of a challenge. Most notable is the presence of two video chips on this machine, which requires some cryptic file editing. Dimensions: 14.35 in. x 9.82 in. x 0.95 in. These instructions largely follow the Debian MacBook Pro installation instructions. You will need a wired Ethernet connection. Clean OS X: I got this machine used, so the first thing I did was wipe the hard drive and perform a clean install of Mac OS X 10.11 (El Capitan). Boot into Internet Recovery Mode: Holding down Option + Command + R on boot will put you in Internet recovery mode, which will allow you to split the partition. You can then start the Utilities -> Disk Utility, select the disk and resize the partition. I resized it to half so the Mac side would still be useful. Boot the thumb drive: Place the bootable thumb drive into a slot and reboot, Holding down the Option key, which will cause an EFI Boot into the network installer. Video Chip Disable: If you do an ordinary boot with this machine, the boot will complete, but the display will show only a blinking cursor. This trick was gleaned from this ArchLinux install page. outb() does low-level port output and writes to the video controller. reboot by pressing the power button to shutdown. The Broadcom 4331 wireless works fine, but you have to install some firmware. Open Source: The concept of standing on others' shoulders instead of toes.